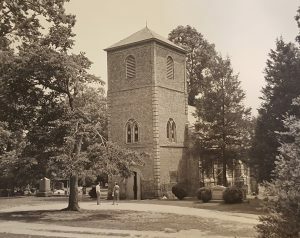 Historic St. Luke's Church: Why do we like Ike? 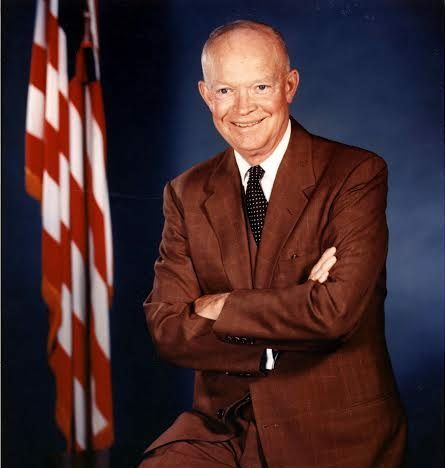 Education Blog Why do we like Ike? SL2008.001.042, photo from Historic St. Luke’s archives. The newly restored Historic St. Luke’s before it opens to the public on May 15, 1957. 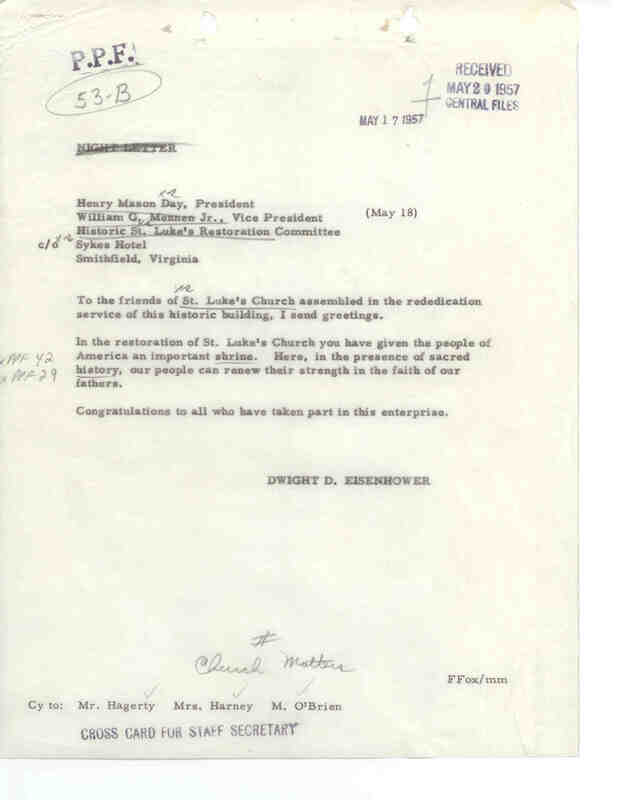 On October 12th, 1956, President Dwight Eisenhower wrote a letter to Mr. Henry Mason Day, the first president of Historic St. Luke’s Restoration. 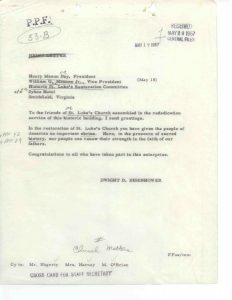 In this letter, President Eisenhower commended those involved in the restoration of Historic St. Luke’s Church and declared that, “St. Luke’s, more than a time-hallowed relic of the past, will be an enduring witness to the spirit that animated them [our forefathers] for within its walls our forefathers gained new courage, firm perseverance, [and] abiding strength to make of the wilderness a home for themselves and all who followed them.” With the help of the Eisenhower Presidential Library, 4 previously unknown documents that explore President Eisenhower’s October 12th letter were shared with me, Research Assistant Lauren Harlow. As October 12th approaches, we recognize this letter and its significance to our site as it represents the importance of Historic St. Luke’s, a symbol of our enduring religious freedom and national pride. SL2008.001.053, photo from Historic St. Luke’s archives. 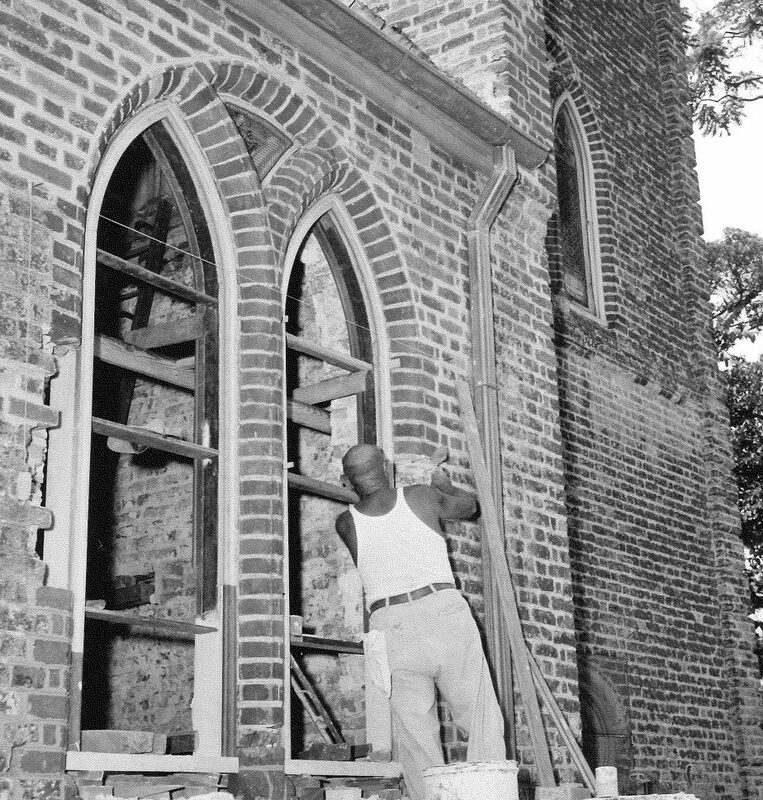 A mason relays and repoints bricks around the windows of Historic St. Luke’s Church during the 1950’s Restoration. 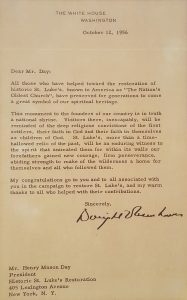 I invite you all to embark on this journey back in time to explore these 4 documents and the October 12th letter from President Eisenhower. The year is 1956. 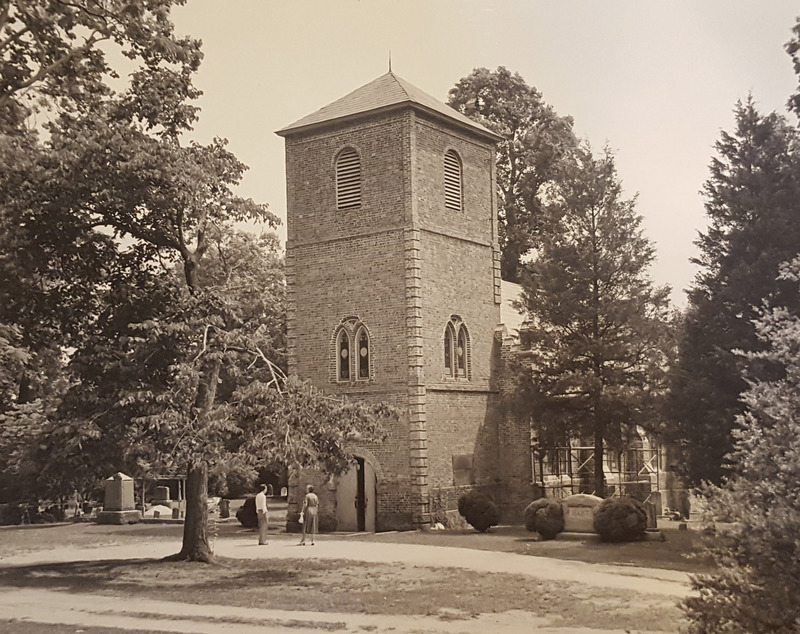 Henry Mason Day and his colleagues have officially announced that Historic St. Luke’s will open to the public on May 15th, 1957, unveiling the 4-year-long restoration during the Jamestown Festival. Years of hard work, extensive fundraising, and careful planning have led up to this unveiling. 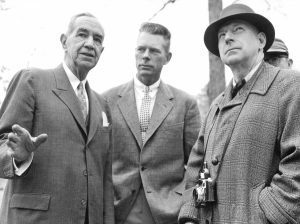 But how does the then-President of the United States tie in to a development taking place in Smithfield, Virginia, far from the politics of Washington D.C.? 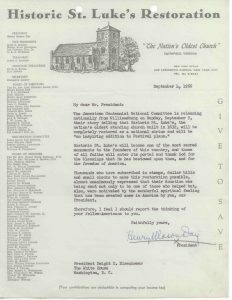 On September 4th, 1956, roughly 8 months before Day’s announcement regarding the completion of the 1950’s Restoration of Historic St. Luke’s Church, Mr. Henry Mason Day sends a letter to the White House. 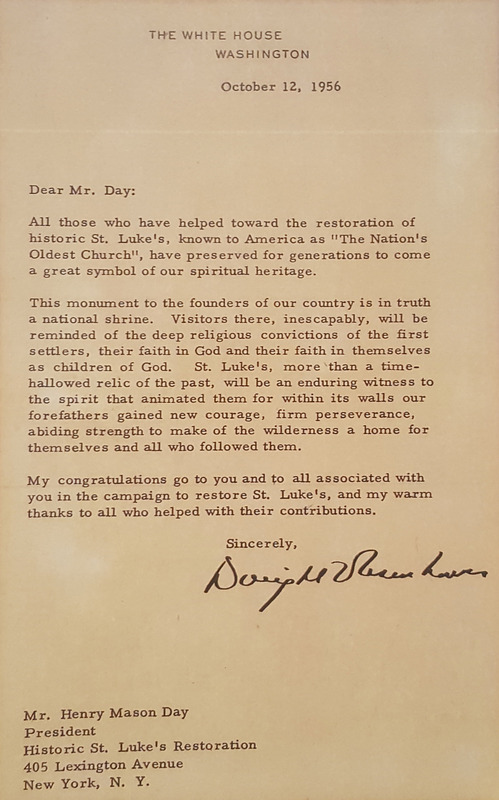 According to Day in his September 4th letter, many of those who donated to the restoration were inspired by the spiritual atmosphere President Eisenhower was creating anew. 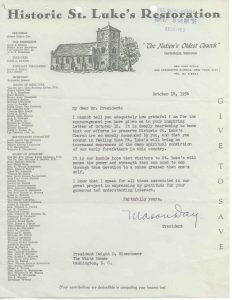 The October 12th letter previously mentioned soon arrived in response, congratulating all that had helped in restoring Historic St. Luke’s. 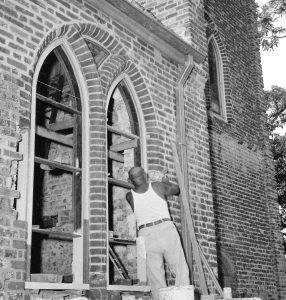 “All those who have helped toward the restoration of Historic St. Luke’s, known to America as ‘The Nation’s Oldest Church’, have preserved for generations to come a great symbol of our spiritual heritage. This monument to the founders of our country is in truth a national shrine. Visitors there, inescapably, will be reminded of the deep religious convictions of the first settlers, their faith in God and their faith in themselves as children of God. St. Luke’s, more than a time-hallowed relic relic of the past, will be an enduring witness to the spirit that animated them for within its walls our forefathers gained new courage, firm perseverance, abiding strength to make of the wilderness a home for themselves and all who followed them. Portrait of Eisenhower taken 1956, photo courtesy of Eisenhower Presidential Library. 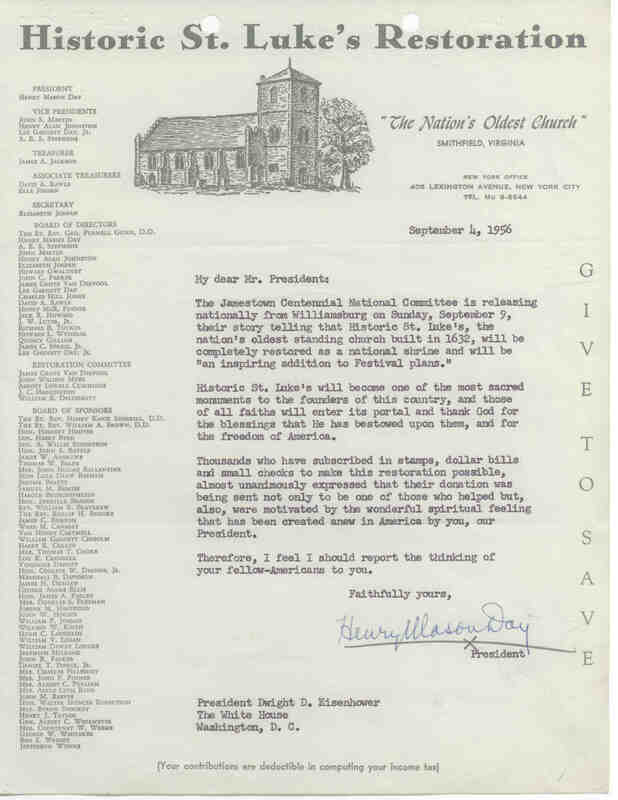 Henry Mason Day writes to President Eisenhower informing him on St. Luke’s restoration. Document courtesy of Eisenhower Presidential Library. 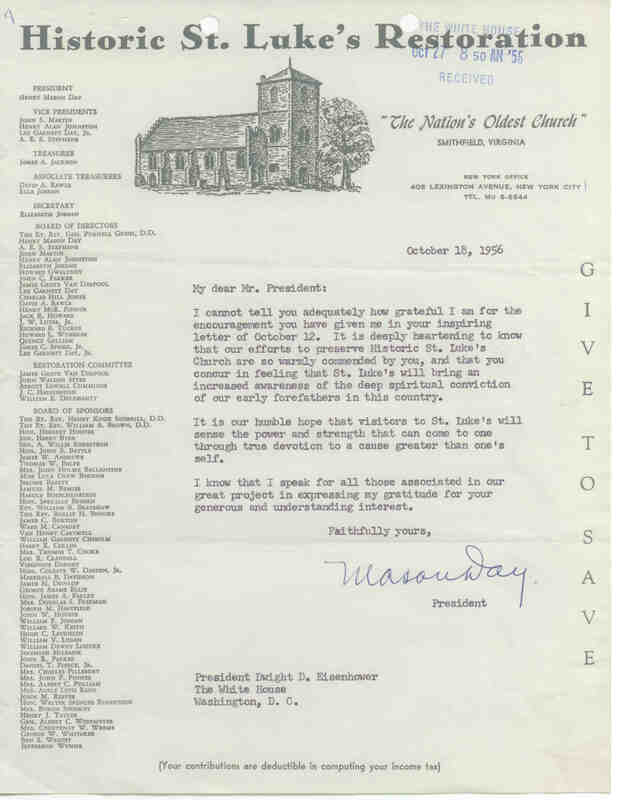 October 12 letter form Eisenhower to Mason Day, declaring the Church a national shrine, and congratulating all who worked on it. Document courtesy of Eisenhower Presidential Library. Henry Mason Day writes to President Eisenhower, thanking him for his October 12th letter. Document courtesy of Eisenhower Presidential Library. 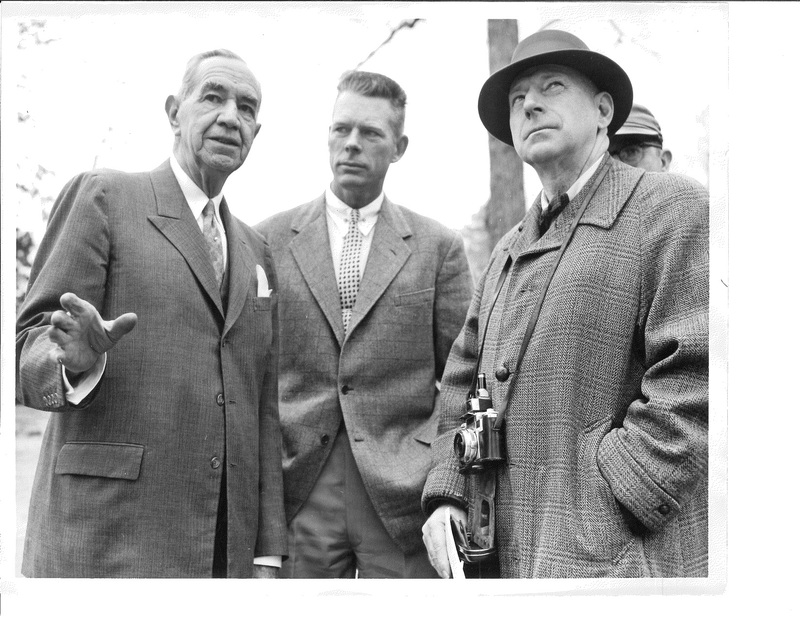 President Eisenhower sends a telegram to Henry Mason Day, thanking everyone who put effort towards the restoration project. Document courtesy of Eisenhower Presidential Library.